The key factors for effective practice outlined in the introduction are not easy to implement or maintain. What might appear relatively straightforward has an uncanny tendency to become derailed. Workers, service-users and organisations can all, either independently or in their interaction, foul good intentions. Psychodynamic understanding within a broad ‘systems’ framework helps to clarify these forces. It illuminates individual and group behaviour and the interactions between people. Its contribution lies in the understanding it provides and the intervention techniques which follow. 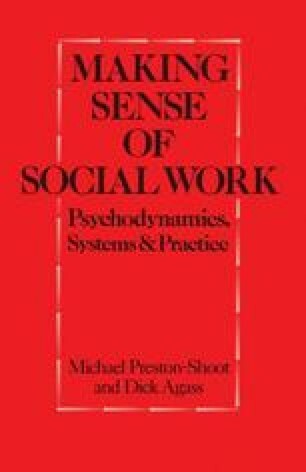 Since the first of these two contributions has been regarded as the more relevant for social workers, we start by examining the value of psychodynamic theory in understanding social work encounters.